In January 2010, the DOE awarded $1.6 million to PPG Industries to develop "Low-Cost Integrated Substrate for OLED Lighting". This program is now finished and PPG has been recognized by the DOE for significant achievements in advancing OLED lighting technology. 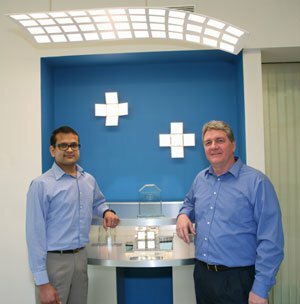 PPG was the only company honored in the OLED lighting area during the DOE 2013 SSL R&D workshop. The team at PPG demonstrated a float glass-based integrated substrate with scalable light-extraction technologies and transparent conductive films for OLED lighting applications. This substrate may lead towards significant cost and performance advantages when compared to conventional indium tin oxide (ITO)-coated display-grade glass substrates. PPG's light-extraction technologies are compatible with the conventional float glass manufacturing process and result in significant enhancement of device efficiencies.